A MASTERPIECE FROM THE MISERY!!!! Celebrated speaker and author Chuck Swindoll tells the story about renowned Austrian composer Gustav Mahler who lived a life marked by a trail of tragedy. During his adolescence, he lost seven brothers and sisters to early death. The coffin became a regular piece of furniture in the Mahler household. And to add insult to injury, the home in which Mahler was raised became a combative battleground of various forms of abuse. Mahler’s father became a cruel alcoholic who often took out his rage by beating up Mahler’s mother. She became a vulnerable invalid who was at the mercy of her husband’s angry blows. Mahler survived this early hell and eventually married. 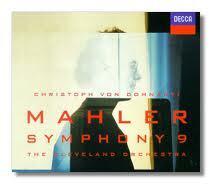 He and his wife were blessed with a beautiful daughter whom Mahler adored. Mahler was energized by nature and he sought being in the great outdoors often. People who knew him commented on the fact that Mahler had a magnificent laugh and an infectious love of life. His family did enjoy some good times together but they too were cut short when Mahler’s beloved daughter lost her life at only four years of age. Mahler never really fully recovered from this loss. Can anyone blame him? Besides losing his little girl, he also lost his position at the Vienna Opera House because of his Jewish heritage. Shortly after that, doctors informed Mahler that he had a serious heart condition and would not live much longer. And in the midst of all this turmoil, music was born. Gustav Mahler composed his marvelous Ninth Symphony, one of classical music’s best-loved, richest and most complex creations. It is my hope that this article itself will cause you to seek out this wonderful piece of music and bask in its richness. By doing so, Mahler allowed his pain to be transformed into passion. We actually get our word English word “passion” from its root- the word “pain.” It is not that Mahler pretended that he had no hardships. It was that he used the emotion and wove it into something beautiful and priceless. The lessons that he learned and the trials that he endured can actually be heard in the melody. If one listens carefully, one can also hear the laughter and the special moments that Mahler shared with his wife and daughter. The lesson of what I am trying to communicate is simply this: I don’t think we can properly sing the song of life from the heart until we have endured a little bit of personal suffering. To use a purely secular illustration that helps prove my point is referring us to the music of the late great, “Ol’ Blue Eyes,” Frank Sinatra. In the 1940’s, Frank Sinatra was the apple of every bobby-soxer’s eye. He sang the hits and the young girls swooned. But his best vocals of the very songs that he performed in the 40’s were actually done again in the 1950’s. But this time Frank had been through some painful setbacks in both his personal and public life and this time when he sang, “I’m a Fool To Want You,” it was as if we were hearing somebody pour out his heart and soul on vinyl because in reality, it was just that. This is why it is no surprise that those of us who have experienced times of incredible grief and overwhelming sorrow have turned the radio of our soul on to allow God’s gift of music to somehow give us strength. It’s funny that when there are no words that do justice to speak what is going on in the inner parts of our spirit, we can still turn to melodies that we may sing our soul so that others around us might get a clue of how we really feel. Wounded hearts that choose to look up rather than give up actually open a door for God to teach us that some of the best beauty that He ever allocated, may well be discovered in our brokenness. Something Beautiful Something beautiful- something good… All my confusion- He understood… All I had to offer Him was brokenness and strife- But He made something beautiful of my life… Please remember, great people who have accomplished great things often come from tragic beginnings. I am praying that even in the midst of the hard times today- God is putting a new song in your heart that not only will you be able to sing tomorrow- but the entire world will be better off because of the music you’ve made.